We understand that you don’t easily find good boutiques for designer menswear at prices that don’t rattle your bank balance, but this one in Meherchand Market is answering all of your men’s wardrobe woes. Opened almost a year ago, Collar is run by duo Mridula and Anju who get their fabrics imported from Italy and London, and it’s nothing but the best (we’d rather have you see for yourself). They also work with materials like Benarasi fabric, handloom linens (you’ll love this if you’re the Fabindia type), cotton, silk, wool and linen mixes, block-printed pure cashmere that look great and feel even better. 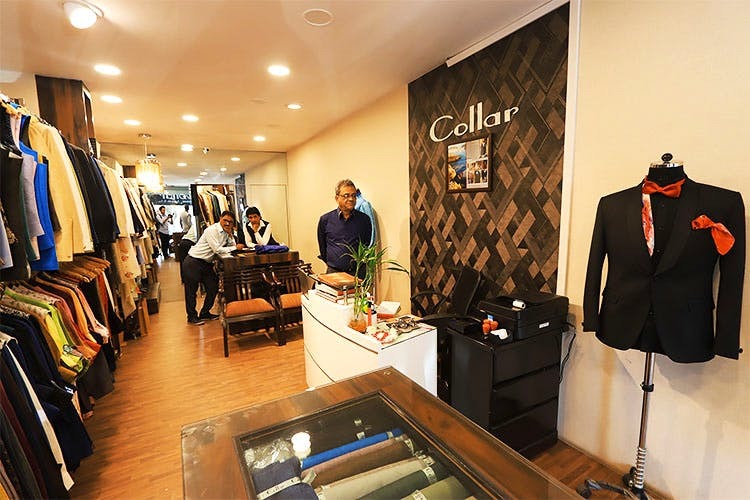 Collar also stocks different kinds of printed fabrics, a ready-to-wear range of clean-cut shirts and bandhgalas, so if you’re a 'solid and classics' kinda guy or the ever-experimenting sort, this boutique has something that'd work for everyone’s tastes. This boutique even offers a variety of buttons like those with antique-looking monograms, plain metallic ones but they personally recommend the Mother of Pearl buttons that look oh-so classy. Remember how we said they’ll ensure that you look dapper? That’s true, because they go out of their way to customise your outfit, will add details and motifs if the outfit requires (with your consent obviously) and sometimes, they do it all for no extra charge! Our colleague, who got two outfits stitched from here, felt that only buying the fabrics from Collar might be a bit expensive. Instead, if you get both the fabric and your outfit stitched at Collar's, the cost comes down significantly. If you want to get a designer-inspired outfit, just show them a reference image and the miracle-workers at Collar won't disappoint. They also offer free home delivery and depending upon the season, they can even stitch a shirt for you in just four days. Since the wedding season's already here, they’re currently getting orders left, right and centre, but they generally take up to 20 days for a sherwani or a full-blown suit. Price: Starting at INR 2,500 (customised shirts), INR 16,500 (bandhgala kurta set).